As you can see in Table 5.2.1, “Attributions to Expected and Unexpected Behaviors,” when the applicant gave responses that better matched what was required by the job (i.e., for the submariner job, the applicant said he was an extrovert, and for the astronaut job, he said he was an introvert), the participants did not think his statements were as indicative of his underlying personality as they did when the applicant said the opposite of what was expected by the job (i.e., when the job required that he be extroverted but he said he was introverted, or vice versa). 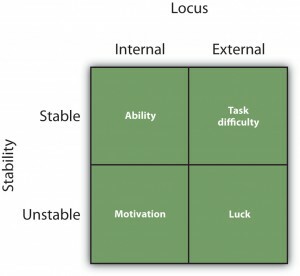 Weiner’s analysis is shown in Figure 5.2.1, “Attributions for Success and Failure.” According to Weiner, success or failure can be seen as coming from personal causes (e.g., ability, motivation) or from situational causes (e.g., luck, task difficulty). However, he also argued that those personal and situational causes could be either stable (less likely to change over time) or unstable (more likely to change over time).